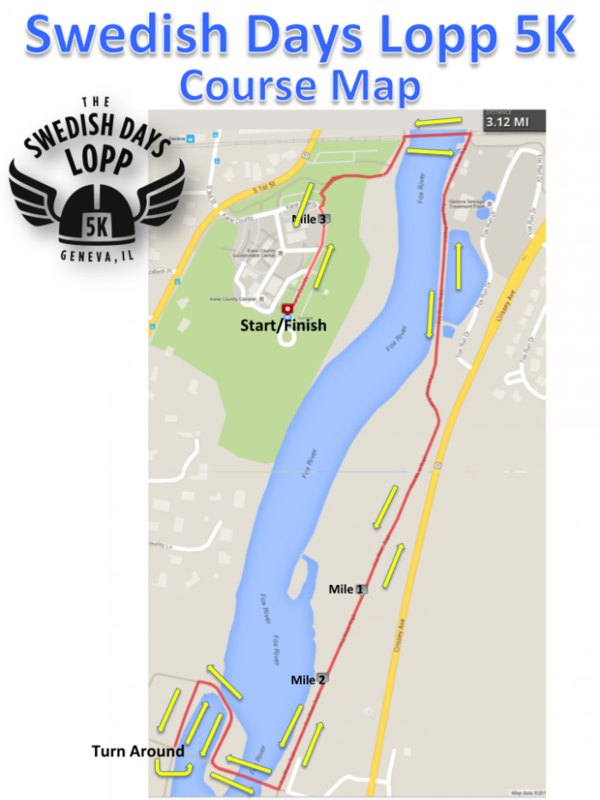 Located along the scenic Fox River in Geneva, the Swedish Days Lopp 5K promises an unbelievable race experience. As part of the Swedish Days Festival supported by Northwestern Medicine, we encourage you to tie-in with the Scandinavian theme with your attire. This spirited race is an annual tradition you don't want to miss. Presented by Geneva Chamber of Commerce and coordinated by Geneva Running Outfitters. Race starts and finishes at Gunnar Anderson Forest Preserve, 719 S Batavia Ave, Geneva, IL 60134 (behind the government center). In addition, there will be a Kids’ Dash race for ages 1-8 that begins at 7:15 am. Register for both races below. IN ORDER TO GUARANTEE A SHIRT AT PACKET PICKUP - YOU MUST REGISTER BY JUNE 11. ALL REGISTRANTS AFTER JUNE 11 CAN GET THEIR SHIRT AT GENEVA RUNNING OUTFITTERS AFTER JULY 4. An email will be sent out to those who have a shirt to pick up. We use a disposable chip timing tag for the 5K that runners receive at packet pick up on their race bibs. It is lightweight and remains attached to the race bib. Unique Swedish Days awards to top 3 Male and Female Overall and medals in the following age groups: 9 & under, 10-14, 15-19, 20-24, 25-29, 30-34, 35-39, 40-44, 45-49, 50-54, 55-59, 60-64, 65-69, 70-74, 75-79, 80 and over. Parking- Spaces will be limited at race start. Availability to cars parked down there will be subject to lot being closed for the race. More parking is available about 1/4 mile from race start at 3rd Street Parking garage. Geneva Lutheran Church Breakfast - 301 S. 3rd St. Authentic fresh-off-the-griddle Swedish Pancakes served with a choice of toppings, sausage links, coffee or juice. All proceeds go to Summer Youth Trip. Anyone who wishes to eat and isn't a registered race participant, will pay the church at the door. $8 Adults, $4 Children under 12. Rain location - Church basement.